“You have a grand gift for silence, Watson. It makes you quite invaluable as a companion." Sherlock's secondary mode of operation fits in well with his primary as a means of sorting out which data is important and which isn't. That secondary mode is introverted thinking (Ti). Despite the fact that he's taking in copious amounts of input, he then weeds through it very logically, discarding what he believes to be irrelevant or impossible. This secondary function is a judging function, which means that it's what Sherlock uses to make decisions, or judgements, about things. His Ti works in lock step with his Ne as it discards data that it finds unimportant, then allows the Ne to go back to work sorting out connections between the input that's been perceived. Notice that the character tends to be full of frenetic energy when there's a new case, new input to be received, a new crime scene to case. He's using all of his senses to take in information around him and find patterns or connections within it. He seems most calm when he's processing the information and weeding out the unimportant details. When a person is extraverting, they're relating primarily to the outside world, which comes out as energy and interaction. When a person is introverting, the action is all taking place inside of them. All of the energy is running through their brain and though the brain can be running at a jillion miles an hour, the outside observer doesn't see the activity, so it looks like the person has suddenly slowed down or is inactive. I've seen discussions online regarding Sherlocks personality type and pretty much everyone agrees he's either ENTP or INTP. In other words, everyone agrees that he's an extraverted intuitive and that he's an introverted thinker. The real question is which of these functions is primary and which is secondary. 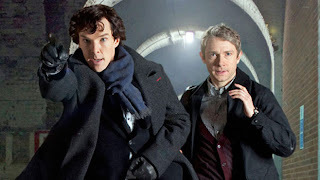 I think a fairly solid argument could be made either way, and of could it might depend upon which Sherlock (from the original books, from a tv show, or from a movie) you're considering as one character might be much more an introvert than an extravert. But the BBC version seems indubidoubly to me to be Ne first and foremost. I've looked at several clips on YouTube in hopes of finding one that most succinctly portrays what I'm talking about, and I wanted to settle on the "I'm bored" scene (which is brilliant and certainly shows my point as Sherlock can't sit still even when he has nothing at all to do. He craves the mental activity that a good brainstorming experience gives him and he'll resort to shooting the wall if there's nothing else to keep him occupied.) but instead I decided to go with this short riding crop clip. It's rather repulsive, but it clearly shows Sherlock physically interacting with the world around him in an effort to correctly sort data he's collected. In other words, if Sherlock was primarily an introvert, he would have found medical books with information about the kind of damage that a riding crop could do. But instead he collects a corpse and tests the riding crop out, quite physically, in order to collect data. The next time you watch the show, pay attention to how much Sherlock moves compared to Watson (an introvert). Sherlock waves his arms around, steeples them in front of himself, jumps and glides and moves all over the crime seen while Watson just stands there, a bit flustered, wondering how he can possibly save a situation that he feels Sherlock has entirely screwed up socially. Which brings me back to the fact that Sherlock is seriously not a people person. He really doesn't like people much and he frequently puts his desire for input and his cutting decision making skills far before social niceties. However, his third function is extraverted feeling, which usually seeks peace and harmony between people. As a third function, however, not only is it not very strong, but it's also a minion to the two higher functions. So when it suits, Sherlock can be charming, or he can ease negotiations or calm people down. But it's not because he truly wants people to be charmed or at ease or calm. It's entirely because it aids either his extraverted intuition (enabling him to take in and make connections with more types of data than he might otherwise have been able to do) or it assists his introverted thinking which might need help in better analyzing a situation correctly. When people use the term "extraverted" they often associate it with being very people focused, the life of the party, hungry to meet and hang out with crowds of new people. There are extraverts that are like that. They're extraverted feelers (Fe). But there are also three other kinds of extraverts - extraverted sensors (crave new experiences), extraverted thinkers (love to check things off their to do list), and extraverted intuitives (like Sherlock). So the next time you talk about folks who are extraverted, don't give Ne's, Te's, and Se's short shrift. Recognize that extraversion relates to being outwardly focused (in some way or other). Some focus on people, some on actions, some on accomplishments and some on ideas and connects, but they're all focusing on the external.